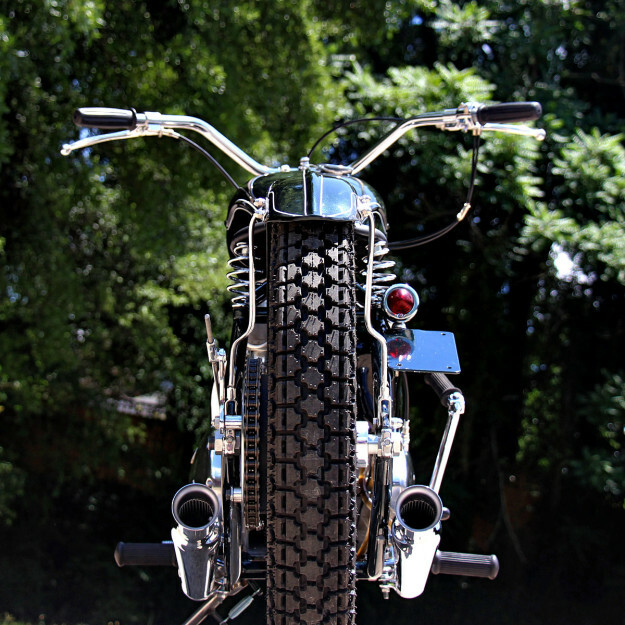 Classic hardtails aren’t our regular fare, but we can’t resist the subtle beauty of a Factory Metal Works build. 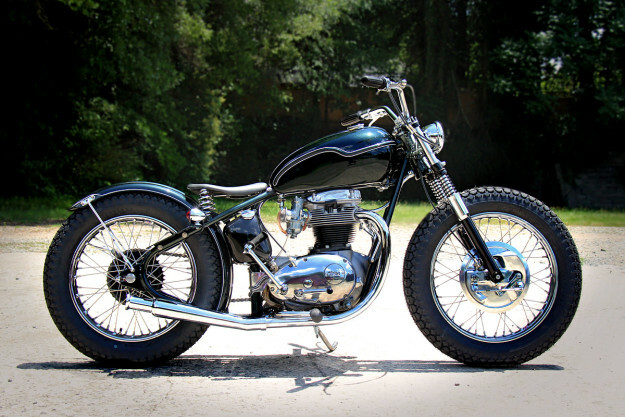 Three years, shop boss Lucas Joyner blew our socks off with an amazing Triumph built for Mooneyes. 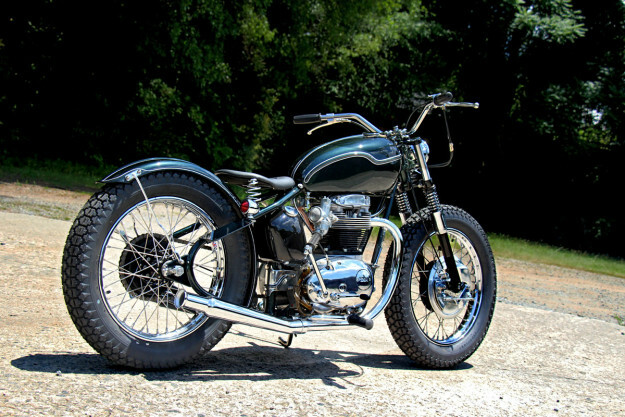 And now he’s back with a beautiful BSA A65, its lovely engine cradled in a hand-fabricated dual-downtube frame. 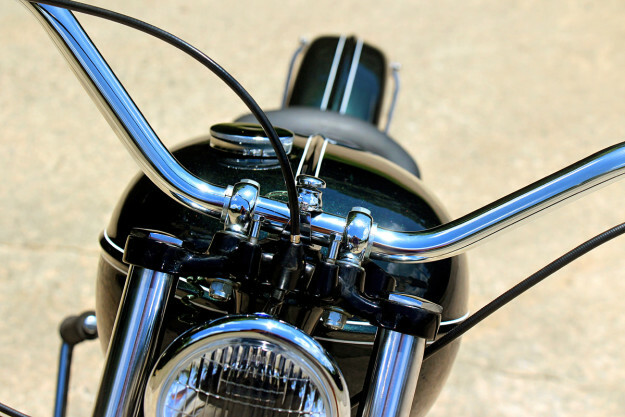 Joyner is a metalworker extraordinaire, but his path to the motorcycle business has been somewhat unusual. He’s been a heavy metal promoter in LA, a recording studio owner and a NASCAR chassis builder. Thankfully he’s now found his true love, and it’s of the two-wheeled kind. The frame is the showpiece of this perky, chunky-tired build. It’s not stretched, but it’s got a 25-degree rake and a 1.5-inch drop, plus slightly shortened sliders to level out the stance. The engine is from a 1971 BSA, so it’s the twin carb model. Joyner has completely rebuilt the 654cc twin and it looks even better than ‘factory.’ The exhaust headers are stock, but topped off with slightly upswept ‘cocktail shaker’ endpipes—a perfect match. The fuel and oil tanks are Triumph items (unit and pre-unit respectively). 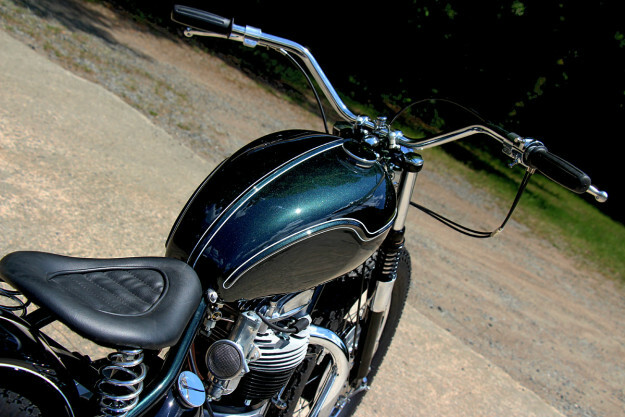 The classy black leather seat is a Factory Metal Works piece, and there’s an equally stylish ribbed fender from The Baron’s Speed Shop over the rear 18-inch rear wheel, anchored with custom-fabricated struts. The rear hub is a pre-1970 Triumph spool hub, laced to a chrome rim. Up front is a Triumph twin leading shoe wheel laced to a 19-inch rim. Everything is clean and simple: nothing flashy, nothing out of place. The bars are uncluttered and the pinstriping is low-key, setting off the dark metalflake paint. 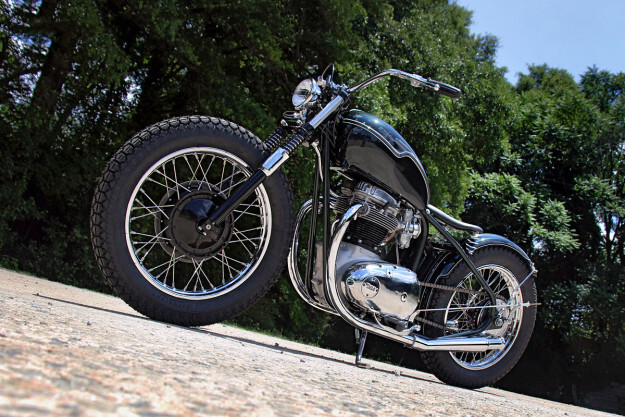 If you’ve got a soft spot for understated retro customs based on classic British iron, head over to Joyner’s website. It’s hardtail heaven.